Gabriele Wadlig is a JSD student from Austria. She earned her first law degree (Magistra iuris) at the University of Graz (Austria). 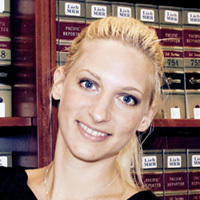 Upon graduation, Gabriele joined the International Legal Studies LLM program at NYU School of Law as a Fulbright Scholar, where she worked as a research assistant for Professor Frank K. Upham. After completing her LLM studies she worked on land rights, property law and development in Cambodia and Namibia. She also holds degrees in economics and sustainable development. Her research focuses on global land governance.